Why do cats like boxes? My cat has a gazillion beds, but she prefers to sleep in an old box from Amazon. Why??? Love the name! I know how much some cats like boxes, but I'm not one of them. My favorite place to sleep is our round powder room sink. It's the perfect shape and size for a nap when I'm curled up with my tail over my eyes. But that's just me. 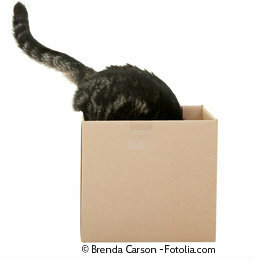 Here are six reasons why most cats like boxes. They're safe. It's hard to find a cat who's curled up in a box. We tend to like confined spaces. We'd rather sleep in something that's a bit too small than too big. One reason for this is that being in a small space helps us conserve body heat. Cats like boxes because they're warm. Did you know this? In a 2006 study, the National Research Council found that cats are most comfortable at temperatures between 86-97 degrees. Since our comfort zone is about 20 degrees higher than yours, we're usually a bit chilly indoors. Boxes are fun! Just ask my friend, Boots. He loves diving in and out of a big box filled with packing paper. They're great for scratching. Check inside the boxes your cats sleep in. I'll bet you'll find some claw marks there. Cats like boxes because they smell good. You probably don't notice, but boxes have a nice woody, sort of musty smell to us. They also absorb our scent, and we like things that smell like us. Your cats will probably enjoy their boxes even more if you put some crunchy tissue paper inside and sprinkle catnip on it. But don't put blankets or towels in them. They could make the boxes smell more like laundry soap than wood, and your cats won't like them as much. Hope this helps! Gotta go now. It's time for a nap, and my favorite sink is beckoning. 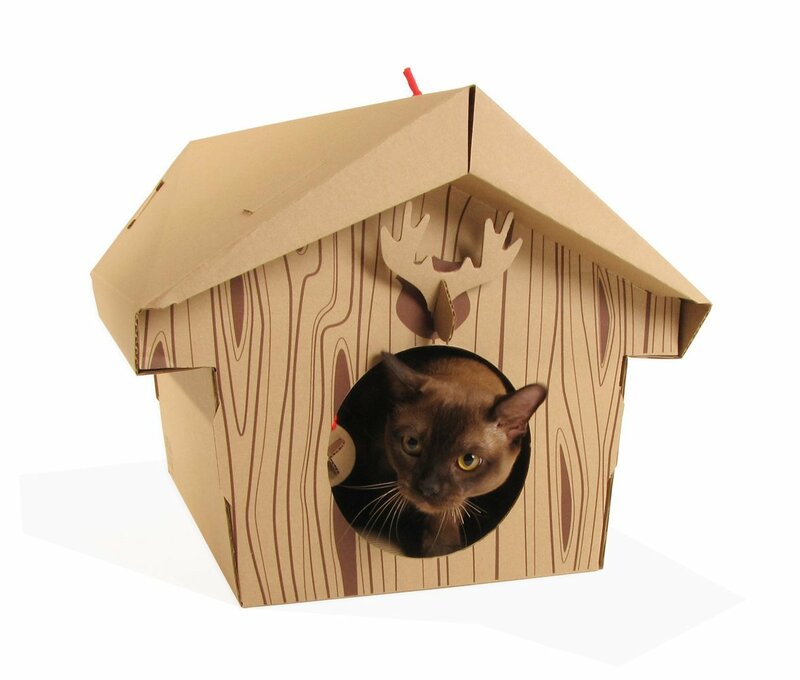 This cardboard cat house looks like fun.